To hear it, you might think you just stepped into Motown. To breathe it, you smell a tropical breeze. To feel it, you let the rhythm grasp your body and whirl it into motion. To see it, is like an extravaganza of light and energy. But to experience it, you must say it …. “I want THE TAMS”!! The Tams were formed in Atlanta, GA in 1962. It’s members were Joseph Pope and Charles Pope (founders), Horace Key, Floyd Ashton, and Robert Lee Smith. In the beginning, they sang and danced as a way of having fun and to escape their circumstances, hoping to make at least a little money. The group began performing in local night spots for $1.25 each. These small wages only allowed for them to purchase matching Tam O’shanter hats to wear while on stage. From this trademark, the legendary Tams name was born. The Tams hard work, patience and perseverance eventually paid off when they were signed to Arlen records and had their first Billboard hit in 1962, the single “Untie Me”, which was number 12 on the R&B chart. In 1963, ABC Records signed them and their first album produced a Top Ten hit, “What Kind of Fool”. They began playing throughout the country and a string of hits followed. These included “Be Young, Be Foolish, Be Happy”, “I’ve Been Hurt” and “Hey Girl”. Since then, they have released over 15 albums and been honored with one Platinum and two Gold records. They have toured and recorded with Jimmy Buffet and performed with such greats as Gladys Knight, Jackie Wilson and many more. 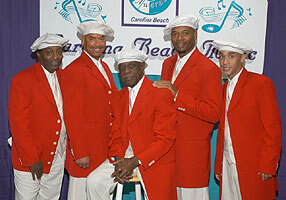 The current members include Charles Pope, his son Li’l Redd, Robert Arnold, Reginald Preston and Greg Gallashaw. Despite the unfortunate passing of “The Legendary Joe Pope”, The Tams have continued to be as popular as ever. Forty two years after the group’s formation, Charles and Li’l Redd continue to lead The Tams toward success. Fans clamor to see Charles Pope – Living Legend, and Li’l Redd – Fastest Feet in the South! And with a new generation of “Little Tams” coming along, Charles puts it best when he says “The Tams will NEVER die” ! !